A few years ago, resiliency theory was relatively new to the fields of prevention and education. Today, it is at the heart of hundreds of school and community programs that recognize in all young people the capacity to lead healthy, successful lives. The key, as Benard reports in this synthesis of a decade and more of resiliency research, is the role that families, schools, and communities play in supporting, and not undermining, this biological drive for normal human development. Of special interest is the evidence that resiliency prevails in most cases by far—even in extreme situations, such as those caused by poverty, troubled families, and violent neighborhoods. An understanding of this developmental wisdom and the supporting research, Benard argues, must be integrated into adults’ vision for the youth they work with and communicated to young people themselves. Benard’s analysis of how best to incorporate research findings to support young people is both realistic and inspirational. It is an easy-to-read discussion of what the research has found along with descriptions of what application of the research looks like in our most successful efforts to support young people. A growing body of research suggests that school climate may be an important variable in explaining why some schools are more successful than others. 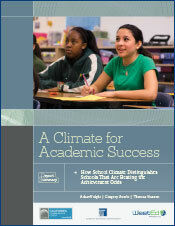 This report contributes to this research by exploring the climate of a handful of secondary schools with extraordinary success (schools in which test scores are better than would be predicted based on their student characteristics) compared to that of other schools, including those that consistently underperform. Ensuring That No Child Is Left Behind: How Are Student Health Risks & Resilience Related to the Academic Progress of Schools? This report raises a critical question facing educators today: Have efforts to raise student test scores come at the expense of basic supports for student well-being — for example, nutrition and school safety — that motivate and facilitate learning?